I got the socks for the husband done and blocked, and he likes them. They are a variation of the Thuja socks from knitty.com. 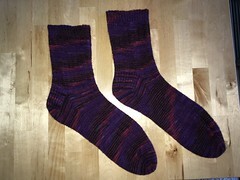 I knit them out of Rabbitworks Fibre Studio Toe Jam (70% Merino 30% Silk) in The Gathering Storm colorway. I originally started these back in August and they were my commute knitting, but I found myself not really wanting to knit on BART, so they languished. Then, the socks I knit the husband last January developed a giant hole in the ball of one of the feet seemingly out of nowhere (Was a little sad about that because it was an 8-ply sock yarn that was supposed to be rather sturdy). Thus, the first month of my personal stash yarn club is complete. Last week I sat down and plotted what I wanted to knit, sock-wise, for the rest of the year. I’ve mixed some WIP socks into it so that I can get them off the needles, but it’s mostly all unballed yarn I’ve been wanting to knit with. February’s personal stash yarn club sock is just a plain knit sock out of Yarn Pirate Superwash BFL in the Calamity colorway. 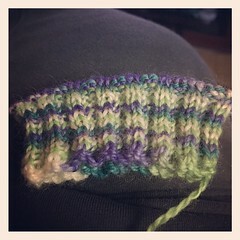 I’m already passed the heel on the first sock and it’s not technically February yet. I figure if I get these done quickly, I’ll pick up a larger project that’s been on hold and try to get some work done on it. I wanted to try to get some of the socks that have been hanging out on needles for a long time done so I can wear them. I also wanted to get some of the sock yarn that has been in my stash for quite awhile knit up. No progress to see here; please move along. I have been so tired from slinging boxes at work the last few days that I’m unable to bring myself to even knit in the evening. So, my Ishbel and my spinning both sit where they were at the beginning of the week. The Ishbel may actually get finished since I just have the lace section left to do. Tomorrow is for Stitches West. I’ve signed up for Janel Laidman’s Getting the Most from a Painted Roving. It goes all day on Friday, so hopefully, by the end of the day I should have some idea of what to do with the handpainted fibers I have slowly piling up in my fiber room. I plan on just having lunch at the bar/restaurant in the hotel so that I don’t have to drive anywhere. Then, into the market. I’m not planning on returning for the rest of the weekend, so all shopping needs to be done during my lunch break and after class ends. This year’s shopping theme is going to be tools/books. I was in my fiber room cleaning it up so my BIL could stay the night and realized I truly do have quite a lot of fiber and yarn and no time to do anything with it. (And I just got into The Loopy Ewe’s sock club for this year and am considering signing up for another year of infliction sock yarn from the Mean Girls Yarn Club.) So, something will have to be truly amazing for me to think about getting it if it isn’t a tool or a book. I also have the mission to buy a couple of skeins of sock yarn and a sock book for my MIL’s birthday, which is in a couple of months. She’s getting back into knitting and the pair of socks I knit for her has inspired her to have more handknit socks of her own. I think I’m going to get her a skein from Abstract Fibers and perhaps one from either Pigeonroof or Lisa Souza; I like the idea of getting her something rather local. The book I’m thinking of getting her is Nancy Bush’s Knitting Vintage Socks. I think she’ll like the historical connection as well as the simple, but pretty patterns in the book. 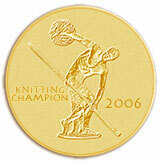 I’m not entirely sure where my Ravelry name pin has gotten too; I’ll have to see if I can find it. I do plan on wearing my Brandywine shawl tomorrow so that I can show it off to Romi in person. See you there!